Interesting. I settled on 100 XP per HD without doing any math. It makes it easier to level at low levels. It makes killing monsters for its own sake less and less valuable as time goes on because XP requirements to level get bigger and bigger per level while the XP gains are linear. This is how I want it to feel: that first orc you kill ought to feel way more important than the 100th. Yeah, agreed that's the best way to base the system -- I also give 100 XP per HD as a default (like for an orc). It's just that monsters with exotic abilities should get a bump up; as you see here, the "EHD" is what I give for "Equated Hit Dice" for XP purposes. So a 5-headed Hydra with 5 HD is treated as EHD 7 for XP; that is, 700 XP. The kernel of that idea comes from an article by Gygax in Strategic Review #2: for XP, a "monster is equivalent to its hit dice, and additional abilities add to the level in this case". You can see a complete OED Monster Database where I've mapped out EHD's for most everything in OD&D. This was done with a Java program I have on GitHub, and if search the blog here for "Monster Metrics" you'll see posts on the development of it. I'm a little surprise a 5 HD monster getting 5 attacks, is not better than a 7 HD monster getting 1 attack. 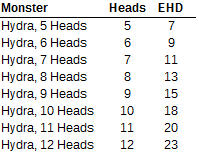 But then again by 7 HD most monsters have some kind of special ability, so it's hard to find a straight up comparison; and the hydra is pretty easy to hit. The "base" EHD is definitely for a monster with no special attacks. E.g. an Ogre at 4 HD is 4 EHD; a hill giant at 8 HD is 8 EHD and so forth. Keep in mind that the drawback for Hydras is that they lose attacks as they take damage. 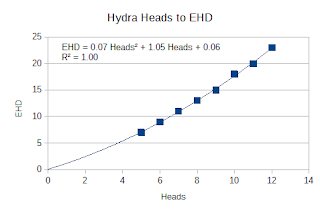 So maybe a 5-headed Hydra really only has an average of 2 or 3 attacks per round over the course of a whole fight?